Is your organization struggling or going through a lot of changes? Are inconsistencies in departmental leadership or differing leadership styles limiting progress or damaging morale? Would you like all of your leaders to be on the same page and heading in the same direction? Would you like your leaders to communicate better and truly lead their people? If your answer was YES to any or ALL of these questions you are in the right spot! Candy has worked with leaders across the country from farmers to CEO’s from Hospital Administrators to Grain Elevator Mangers from Human Resource Directors to VP’s of financial industries….and she will tell you, “People are people and we are ALL leaders… we just have to hone our leadership skills.” The Leadership and Workplace Culture Series will tap into all the skills every leader must have to truly LEAD their teams. In Part I, Candy will take you through a brilliant exploration of the 4 personality styles. You’ll learn to overcome personality differences that lead to problems like communication breakdown, negotiation let-down, and delegation fall-down by learning the secrets to connecting and partnering with other personalities. Candy will share her 4C’s of Leadership: Confidence, Communication, Creativity and Change in the workplace. Last, you will dive into your Emotional Intelligence so you can be proactive instead of reactive. You will Change your attitude about the people you work with and leave knowing that people are not difficult, they are just different…It Takes 4 To Tango! Part II is an exploration of the generations in the workplace…there are 5 now! In this group activity you will get to discuss what motivates you, what is your work ethic and what is a burning question you would like to ask another generation. The good news is YOU will be with your own generation to discuss these questions so we can truly learn to work better and be more productive with ALL the generations. Candy will also teach the importance of change management skills and the 7 differences between a Leader and a Boss. Change can lead to conflict sometimes…you will leave looking at change and conflict in a whole new way! Learn what the 4 “Animals” (personality styles) look like during stressful situations and during change. Candy’s Pre-Workshop Questionnaire will be sent to each Leader via email after Part II. We will be discussing the results of the questionnaire in Part III. Part III is diving deep into what kind of Leader you are and/or plan to be. You will be working on your W.O.W. Philosophy (Way of Working) using your mind and your creativity. Then you will understand the importance of coaching your employees; learn the 8 benefits to coaching. Now that you are the Leader, do you feel like there is just not enough time? Candy will teach her top two ways to figure out what is truly important when it comes to time management and we will even make that team meeting more timely and effective. 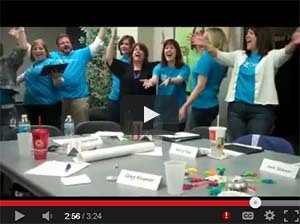 Last, you will break into teams for a rousing game of "What Did We Learn" in the Leadership and Workplace Culture Series? Candy ends the series with a review that is full of interaction, fun and application tools for each Leader to excel! This Series is normally presented over several days and spread out over time to allow participants to absorb and apply the tools and techniques learned in each session. This is a hands-on, roll up the sleeves and address the real issues kind of training. The idea is to tap into all the skills every leader must have to truly LEAD their teams, and get everyone on the same page and heading in the same direction. "Candy’s workshops have brought a lot of energy and enthusiasm to our organization. We are consistently receiving outstanding reviews and it never fails someone always asks “when is Candy coming back?” It all started when Candy facilitated one workshop 4 years ago and we immediately saw the impact it had on our management team. With Candy’s drive to better support our organization, she is now presenting a 3 part Leadership and Workplace Culture Series several times a year for us."